Colonial Spirits Loves Rye Whiskey! 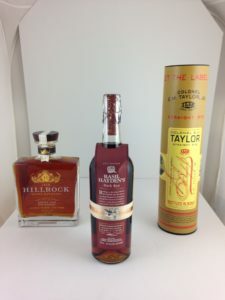 Colonel E.H. Taylor Rye-This is a bottled-in-bond rye (100 proof, single warehouse and distiller +distill season, 4+ years in barrel) that is produced in very limited quantities and extremely high quality. Peppery and creamy with a very long finish and an assertive character. Basil Hayden’s Dark Rye-This is an extremely limited release in this part of the country (we only received a handful of bottles). Bottled at a more delicate 80 proof, this rye is unusual in that it is finished with a touch of port wine to add a slight sweetness to the finish. Hillrock Estate Distillery Double Cask-The philosophy behind this rye is to create a more nuanced, less “biting” rye. The new oak aging on this whiskey is a little bit shorter, then finished in a lightly used barrel American Oak barrel. This allows the flavors of the oak to come through but not as much of the oak tannin, which can overwhelm more delicate flavors in some cases. As always, let us know if you have any questions about these or any other of our fine products! Age Your Own Whiskey at Home! 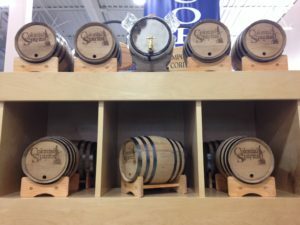 ge your own whiskey with our 3 liter oak barrels! Due to their small size and high surface ratio, it may only take 2 months to reach a flavor that’s just right for you! 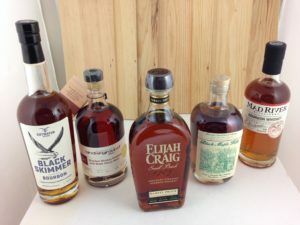 New and Rare Bourbon and Rye! We have some new releases for us, some very rare ones as well (Elijah and Black Maple Hill Rye!) 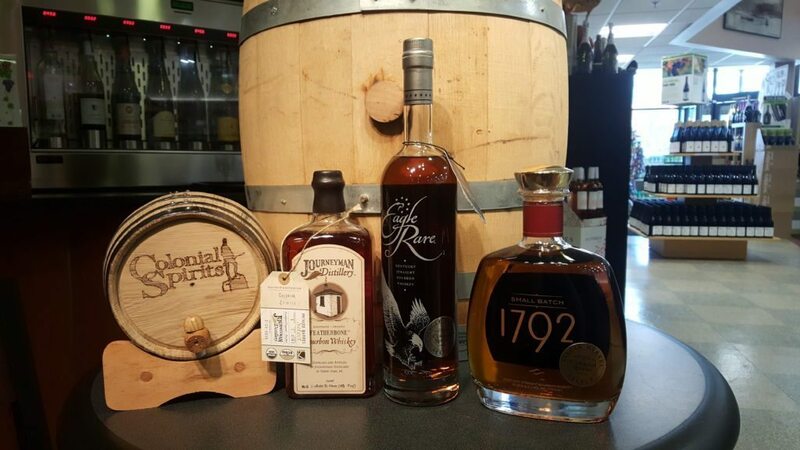 Colonial Spirits is your Whiskey destination store! Introducing Colonial Spirits’ first Single Malt Whisky private barrel… The independent barrel for independent retailers is a unique collaboration between like-minded retailers, who also happen to be Scotch enthusiasts. Bourbons are all the rage these days, especially Single Barrel Bourbon. These unique offerings are hyper-focused on nuances that barrels impart. Each barrel has its own unique characteristic that is conveyed in the Bourbon which is why most bottles have batch and barrel numbers printed on them. Barrels are a great tool as they can mask flaws, soften “hot” mashes, and sweeten when necessary. That is why in the right hands, Single Barrel Bourbon can be unforgettable. We take joy and pride in picking out Single Barrel Bourbon because it gives us an opportunity to showcase our palate. Picking a single barrel allows us to develop a house style. What is our house style? Balance. Looking to strike a balance between flavor, body, and ABV all of our picks do just that in their own right. -SOLD OUT- This high wheat mash Bourbon is an under-the-radar favorite among Bourbon enthusiasts. Having a similar DNA to its cousin (PVW), this gem has the body and flavor to compete with the best. Some may call this too hot (107 proof), but if anything we think it is just right. Our pick tends to put emphasize on the oak influence as it helps dampen some of the heat it carries. -Limited Availability- A mash consisted of corn, wheat, barley, and rye, the Featherbone Bourbon is balanced from the get-go. Journeyman is said to be too balanced, soft even, this is why our single barrel has a hint more barrel influence. This adds additional depth through added layers of flavors. If that wasn’t enough, we ask Journeyman to bottle our Bourbon at barrel proof. Just one more step we take to create a multifaceted and beautiful bottle. Eagle Rare 10yr is unique because every bottle is from a single barrel instead of being blended. This sets them apart because with each new barrel the whiskey changes. Some like this concept, others, however, have had a hard time wrapping their minds around it. Luckily for everyone, you can count on our selection to be consistent barrel after barrel. Our Eagle Rare 10yr barrel arrived a week ago, but that doesn’t mean you should put off getting a bottle. If you would like to make a purchase Click Here. In the “Notes Section” specify you want the Colonial Spirits Single Barrel. The “high rye” 1792 can seem a bit light and spicy for some, but taste is personal. For those that find it a bit light, come and try our barrel because we got it right. The balance of spicy and sweet notes, alongside a medium frame and a drier finish makes this a Bourbon for the Scotch Whisky drinker. Or if you are looking for a break from the over-oaked Bourbons that are flooding the shelves, this is it. As the days get shorter and colder and as Thanksgiving and Christmas near us, we find ourselves looking to stay warm both inside and outside. There are few drinks that do that as well as Bourbon. And if you are planning on purchasing one, why not guarantee yourself a knockout. All of these are just that.